I've been hauling a few drugstore beauty stuff for the past three weeks and I wanted to share a haul post with you. Some of them are skincare essentials, and I also got a few other things for my hair and make up. So let's start! Well this gel cleanser needs no introduction, you all know that's the only gel cleanser I've been using for many years, and I keep repurchasing it every 4 months or so. It's perfect for oily and acne prone skins. But right now I'm using this along with another foaming cleanser I've been testing out from Garnier and I have to say that I'm really impressed by it, but I'm going to mention it in another post. 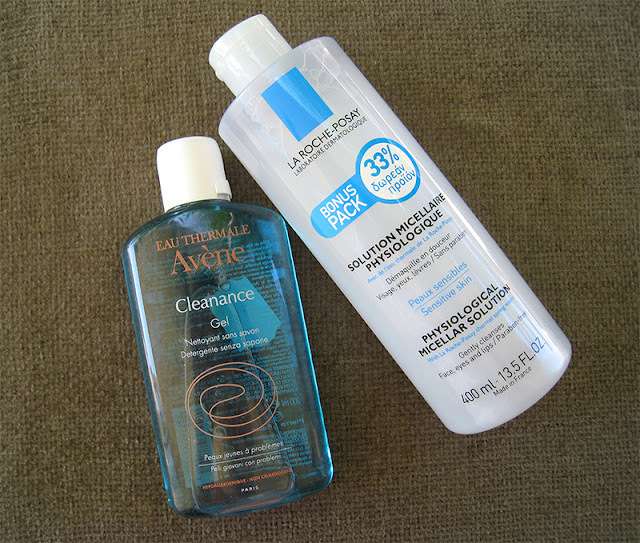 When I first bought this micellar lotion I got it in the small 200 ml bottle because I wasn't sure if I was going to like it, but I ended up loving it and now that my small bottle finished I had to repurchase it in the big 400 ml bottle. In my opinion it's the best micellar lotion for oily skintypes from all the ones that I've tried. Buying a face sunscreen was an absolute necessity for me, because the summer in Greece is always super hot and sunny and also it can be very dangerous if you don't protect your skin from the sun. I have a really bad relantionship with face sunscreens, because every single one I try it always ends up breaking me out. Last year I mentioned that my HG was the Korres Sunscreen Face Cream SPF50, because it was the only one out of the 4 face susncreens that I've bought that it didn't break me out, but it was kind of oily, and not very suitable to use it underneath any face make up. 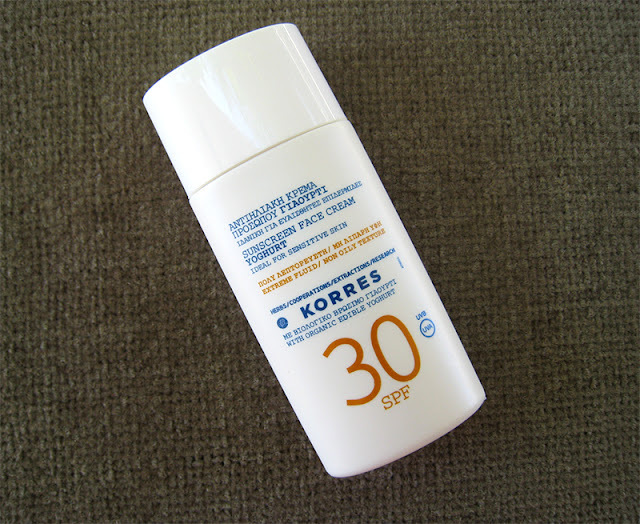 But this year Korres came up with a face sunscreen with liquid texture from the same Yoghurt line so I knew that I had to get it, and it's so good! It has a very liquidy- milky texture, it reminds me of asian sunscreens like the ones from Shiseido Anessa, but these ones end up drying out my skin. The Korres one, once you apply it onto the skin at frst it feels a little sticky and then it dries out matte, but it gives a refreshing/cooling feeling on my cheeks, I guess it must be the yoghurt because the SPF50 cream one also did the same thing. That was a first impression of this sunscreen for you, and the good part is that it hasn't broke me out yet. It was about time to change my mascara, the one I'm using right now is Maybelline's The Rocket, and I'm going to do a review really soon about it, but I didn't want to repurchase the Rocket one again, so I got for my trusty L'oreal Mega Volume Collagene 24H one. It's one of the best mascara's I've ever tried in my whole life, not only better than other drugstore mascaras but also from high end ones. It gives amazing volume and length, it never clumps, it separates really well and it's so lightweight like a mousse, it never irritates my sensitive eyes. 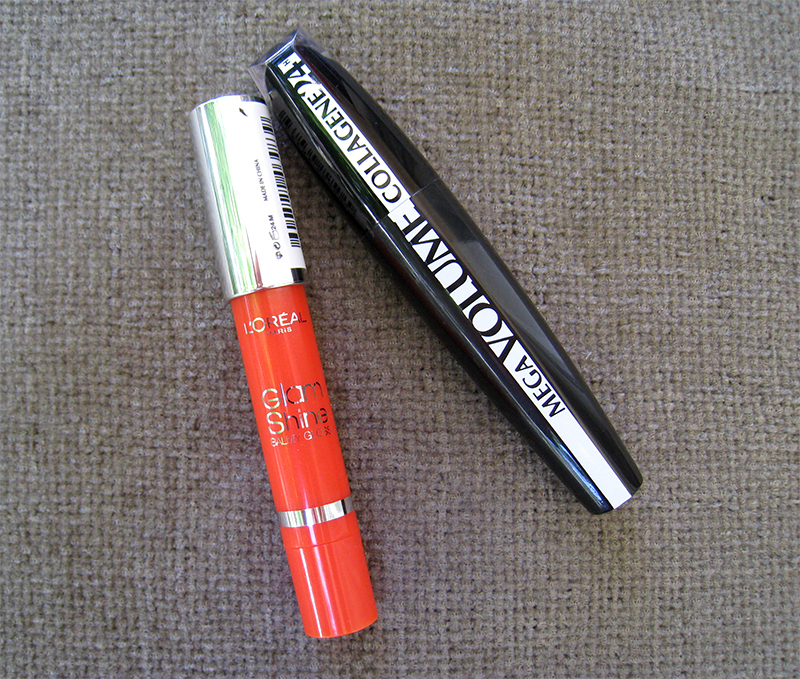 No matter what other mascaras I'll try in the future, this is the one that I will always come back to. 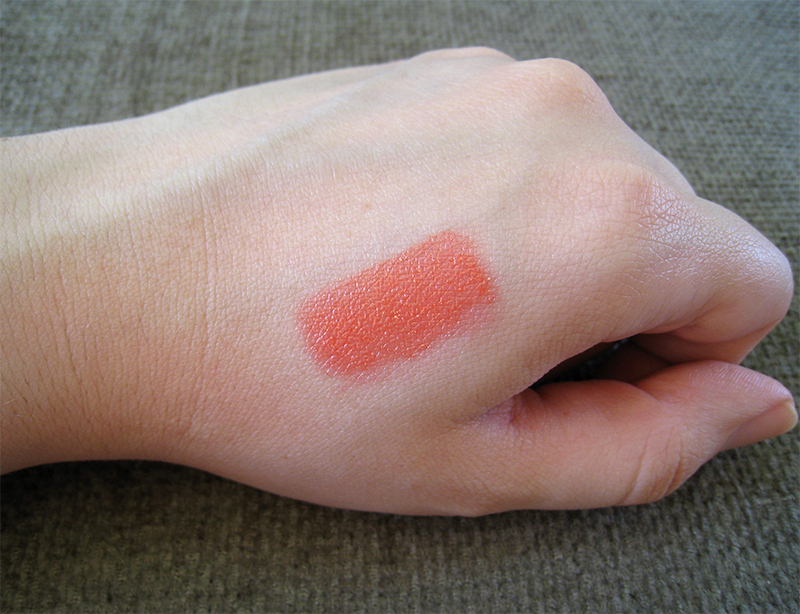 I love it so much that it's the only lip product I've been wearing since I got it. It's very hydrating also, and if you have dry lips like me, it doesn't make the dry parts visible at all. Since I dyed my hair a month ago, it transformed from oily to dry in a few days, and all the hair care products I have weren't enough to make it softer and more managable, not even the Moroccan oil. I had a few samples of the original L'oreal Extraordinary hair oil, and it was very good, it made my hair really soft and healthy so I decided to purchase the full bottle, but I got the one that is specifically for died hair. It gives almost the same results on my hair with the original one, but not quite as good as the original one so that was a bummer, but it's still pretty good, better than the Moroccan Oil for sure which worth twice the money for only 25 ml of product! Yes I know, another hair oil, but when I see a new released product with 40% off I just can't resist! This is a new line from Sunsilk here in Greece, it's made specifically for dry to very dry hair, the line includes a shampoo, conditioner and this nourishing oil spray. The neon yellow packaging caught my eye immediately, it's so pretty and summery, I think Sunsilk did a really good job with the packaging. I've used this hair oil spray four times so far, and I know you may think it's too early to say that, but OMG this product is what I've been looking for years! I'm so amazed by how good it is, and the result it gives on my hair is so good that I can't put into words. It was such a random purchase, I actually bought it because I wanted a leave in product in a spray bottle to use it for when I'm in the beach to detangle my hair, I never thought that it would be that good! It's a duo-phase product, the top milky part is a liquid conditioner and the transparent low one is oil, and you have to shake it up really well before you spray it on your hair. I spray it about 4 to 5 times, all over my hair, then I comb my hair and I blow dry it. Literally the result is very, very good, it helps straighten my hair even better than my beloved Sunsilk leave in cream that I've mentioned in previous posts that it has been my HG blow drying product , but this hair spray oil tops that for sure! The best part is that it leaves my hair ridiculously soft, actually I've never felt my hair that soft before. It seems that the random purchases are the best, Sunsilk never fails to amaze me when it comes to condinioners and leave in products! Please try it if you can, you won't regret it! 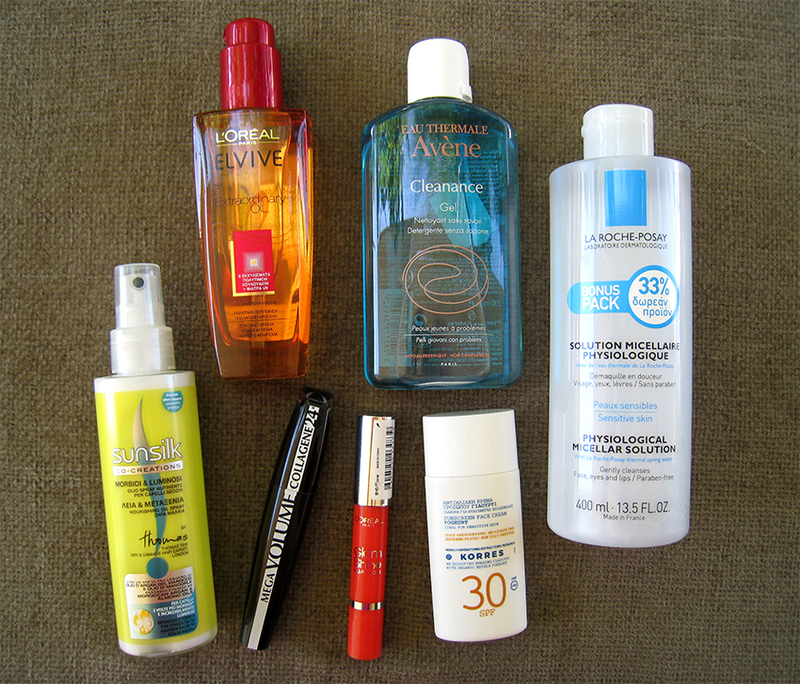 OK that's it for my drugstore haul for this month. Please let me know if you've tried any of these products and if you like them. 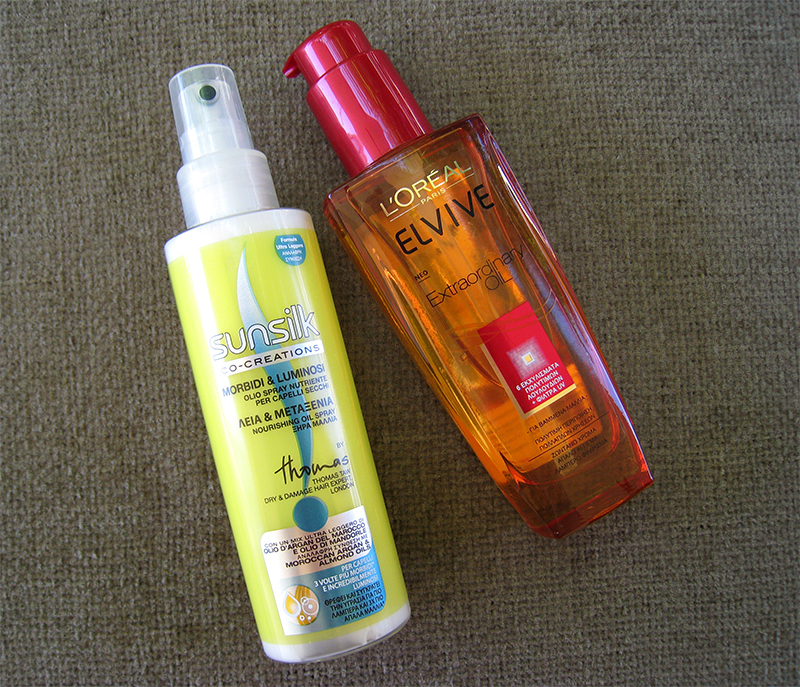 And if any of you tried the Sunsilk Nourishing Oil Spray, let me know if you like it as much as I do! Δεν ξερεις ποοοοσο χαρηκα που ειδα ποστ σου !!!!!! Τι ωραία! !Και γω το είδα αυτό το leave in από Sunsilk! !τόσο καλό είναι? ?Ε ναι το δοκιμάσουμε τότε! !χεχε!Εγώ από την Sunsilk είχα το πορτοκαλί leave in γαλάκτωμα!Τέλειο κι αυτό!! Τα leave in της Sunsilk τα λατρευω, το αγαπημενο μου ειναι το μωβ. Πολύ ωραιες αγορές, η μάσκαρα και το balmy gloss δείχνουν εκπληκτικά! Ειχε περιπου 6 χρωματα αν θυμαμαι καλα. Η αρχικη τιμη ειναι 12.5 ευρω. Στα Χοντος τα βρηκα, ειχε ολη την σειρα με conditioner κ σαμπουαν. 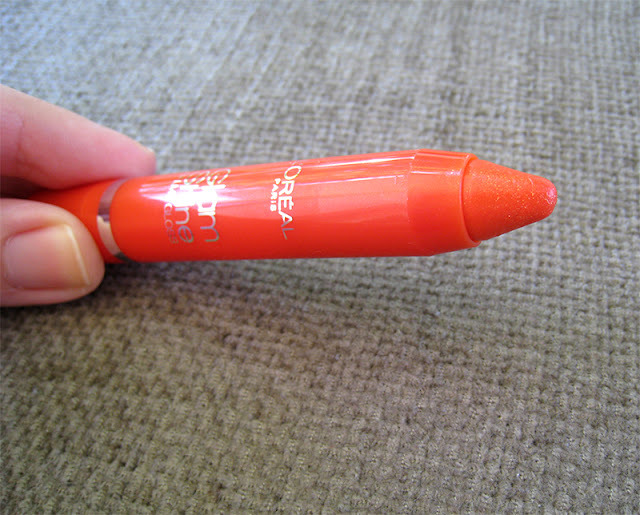 Yeah, it's one of my HG mascaras! Το balmy gloss πολύ ωραίο χρώμα! Ίσως πάρω κάποιο! Με γεια όλα! Με γεια σου όλα! Θυμασαι μήπως πόσο κόστιζε το lip balm της L'Oreal?Φαίνεται τέλειο!!! Thanks :) Η αρχικη τιμη ειναι 12.5 ευρω, αλλα εχει ενα κουπονι για -2.5 ευρω.